Why did war break out in 1914? An enormous amount has been written about the causes of the war and the general opinion of historians has changed greatly during the period since 1918. The opinion of The Allies as the war ended was very clear; Germany was to blame. Germany was required to accept responsibility for the war in The Versailles Peace Treaty, was forced to sign the “War Guilt Clause” and forced to pay reparations for the extensive destruction caused in France and Belgium during the four years of fighting. However, from the 1920s and 1930s onwards, attitudes began to change and the war was seen as a tragedy into which Europe had fallen, caused by factors in which all countries could be seen to bear some of the blame. But from the 1960s onwards, this view was challenged and many modern historians now see the ambitions and actions of Germany as the major factor in the outbreak of war in 1914. This is a subject which will undoubtedly continue to be discussed and written about for many years to come. 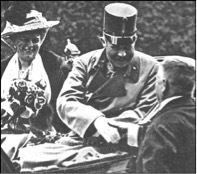 Archduke Franz Ferdinand and Duchess Sophie at Sarajevo on 28th June 1914. Unrest in the Balkans, the area of Southern Europe between the Adriatic Sea and Black Sea, played a key role in the outbreak of war. It was in this region that the incident leading to the outbreak of war, the assassination of Austrian Archduke Franz Ferdinand and his wife, took place on 28 June 1914. For centuries this area had been part of the Turkish Empire, but, as Turkey’s power declined, national groups broke away and formed new countries to govern themselves. This process was encouraged by Russia as a means of increasing her influence in the area and new countries such as Serbia looked to the Russian Empire for support. However, the ambitions of new Balkan states, particularly Serbia, which also claimed territory ruled by Austria, were seen by the Austrian Empire as a direct threat. The Austrian Empire was made up of a patchwork of different nationalities, which also included modern day Hungary, the Czech Republic, Slovakia and parts of Poland. These peoples were also beginning to demand the right to govern themselves and this threatened to tear the Austrian Empire apart. Austria was determined to remove the threat of Serbia and the assassination of Franz Ferdinand by a member of a Serbian terrorist group gave Austria a justification to attack. However, the crisis which arose from the assassination could not be kept local within the Balkans as the European powers were tied together in a series of alliances. These alliances have been seen as a key factor which resulted in the assassination dragging all of Europe into war. Germany had an alliance with Austria and Italy, this group often being referred to as The Triple Alliance. France had an alliance with Russia and, although Britain was not formally part of this alliance, she developed close relations with these two countries from about 1900 onwards; this group is often referred to as The Triple Entente. After the assassination of Archduke Franz Ferdinand, Austria was determined to attack Serbia while Russia was determined to support Serbia. Because of her alliance with Austria, Germany would be required to intervene to support Austria against Russia, which would then involve France who was bound by alliance to support Russia. The alliance systems also bred mistrust and fear and each country had built up large armies. Austria was not the only country in Europe bearing a grievance, however. The German Empire had been established in 1871, but Germany had come into being at France’s expense, following the decisive defeat of France in The Franco-Prussian War of 1870-1871. The creation of the new German Empire was declared in Versailles in 1871 while Paris was under siege. France was further humiliated by being forced to hand over the provinces of Alsace and Lorraine to Germany as part of the peace treaty which ended the war. A movement seeking “revanche” (revenge) established itself in France, though its influence prior to 1914 was limited. Although each of the Great Powers in Europe had grievances which help to explain the outbreak of war in 1914, modern historians have focused more and more on the role of Germany. After 1871, Germany became a major world industrial power rivalling Great Britain. Yet many leading figures in Germany believed that Germany was being denied the position in the world that she deserved as a result of her industrial strength. 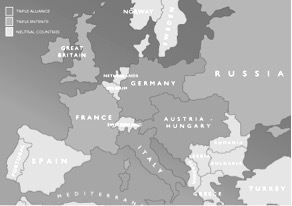 There was a belief that Germany was being “surrounded” by Britain, France and Russia and being denied the position that she deserved in Europe and the world. Germany began to seek colonies overseas and began a programme of naval expansion, which was clearly intended as a challenge to Britain. Britain drew closer to France and Russia and also began to increase the strength of her own navy. 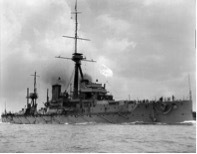 The launch of HMS Dreadnought introduced a new class of warship and sparked an arms race at sea as Germany responded with her own new warships. There was a belief held by some leading figures in the German military and government that war was inevitable and Germany’s actions in 1914 were important in driving Europe towards armed conflict. Rather than restraining Austria following the assassination in Sarajevo, Germany encouraged action against Serbia. It was not inevitable that France be drawn into the war, but Germany’s only plan for war involved attacking France and this attack was to include the invasion of neutral Belgium. This attack took place on 3 August and was undoubtedly the decisive factor in support for the war amongst public opinion in Britain. Yet even as war broke out, few realised the four years of horror that was to follow, leaving ten million dead and changing the face of Europe for ever.